Ridgefield resident Corey Londoner is a one-woman powerhouse who, for years, served as JoyRide as owner, manager and one of it’s most epic teachers! 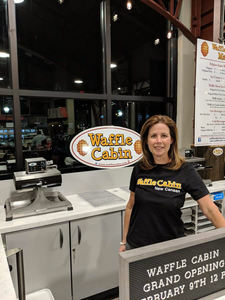 This month she will add to her incredible resume of accomplishments by opening up a new restaurant in New Canaan called The Waffle Cabin! I had the honor of interviewing Corey about her exciting new endeavor. First of all, congratulations on your new business! What prompted you to start a new business and why waffles? After I sold JoyRide Ridgefield, I was looking for something new to do. While skiing at Stratton Mountain in Vermont, we always got waffles from Waffle Cabin. We loved them so much and I saw how the line was always so long all day long. I thought this would do great in Fairfield County. Why only have them when we ski? I am lucky to have a culinary background as well so it was the perfect fit! How would you describe the atmosphere of your restaurant? Will it have the vibe of one of those Waffle Cabins on a mountain in Vermont? I actually have a very unique situation. I will be part of Pine Street Concessions on Pine Street in New Canaan which is a high-end food hall with 3 other chef-inspired food counters- Dante's Pizza, Miyuki, and Greens On the Go. I am really excited to be part of such an amazing group! What can customers expect when they come to the Waffle Cabin? Will the waffles all be homemade? Anything else served on the side? The waffles are all made fresh. They are authentic Liege style Belgian waffles which means they are a yeast-based dough, not batter like Americans are accustomed to. They are infused with sugar pearls which caramelize when cooked making them sweet and crunchy on the outside and soft on the inside. No syrup is needed! They are great on their own or drizzled with a delicious Belgian chocolate drizzle. We will also be serving Soco Creamery all natural ice cream out of Great Barrington Ma. Customers can top their waffle with ice cream, whipped cream and chocolate drizzle or order ice cream in a freshly made waffle cone or cup. We will run monthly specials like a waffle with strawberries and whipped cream. We will also be serving hot chocolate and hot spiced cider as well as other beverages. If you were to make your own perfect waffle confection, what would it be and why? I absolutely love them on their own but I have to admit I can't resist a fresh waffle topped with vanilla or cinnamon ice cream drizzled with Belgian chocolate and freshly made whipped cream! You've got a solid track record of entrepreneurial success. What advice would you give to aspiring small business entrepreneurs? I truly have been blessed! I am still an investor with JoyRide and consider them family. I think my best advice is to find something you are passionate about. Then it doesn't feel like work and you look forward to it! Also surrounding yourself with great people. So many past employees and customers from JoyRide have become close friends. I know I will add to that at Waffle Cabin!. I can't wait to open Waffle Cabin New Canaan and share these delicious waffles that are already so loved by skiers. Opening day will be this Saturday, February 9th at noon! The Waffle Cabin will celebrate its Grand Opening this Saturday from 12:00 to 8:00 PM!